The Japanese language version of Chinese state media site China.org.cn recently ran an article titled "Four Major Trends in Aircraft Carrier Development." Guess one of those trends is Battlestar Galactica art. China.org.cn (AKA China Internet Information Center) is a Chinese Government-authorized website (read: state media) and translates articles into a variety of languages, such as French, German, English, Japanese, Korean, Russian, Arabic, and more. The issue here is about a futuristic aircraft story appearing on the Japanese language site. As South China Morning Post points out, the article covers topics like advances in missile defense systems, drones, and electromagnetic catapults and how they factor into developments in aircraft carriers. However, online in Japan, people wondered if the images that appeared in the article came from a video game or from famed anime Macross. 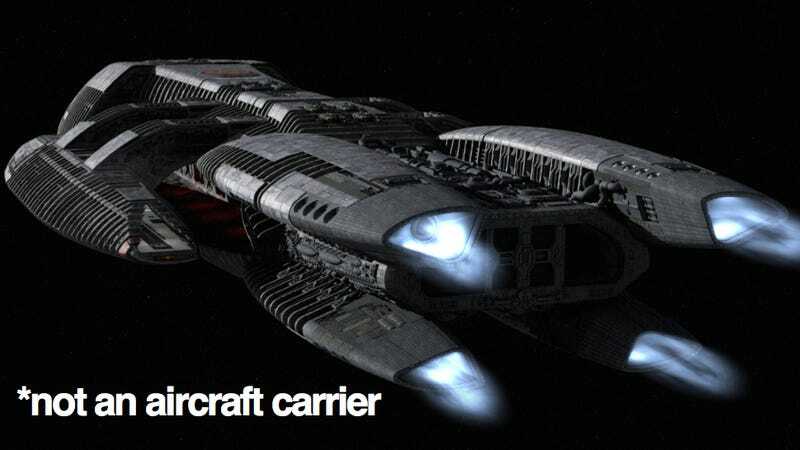 One net user figured out that the image actually was a Battlestar Galactica schematic—which, obviously, has little to do with aircraft carriers! Another image that appeared in the article was a floating city concept design by a Belgian architect. Likewise, not much to do with aircraft carriers! This is reminiscent of when Chinese newspaper Global Times ran photos of a new Japanese military helicopter "design concept"—which was actually a DeviantArt creation. As of publication, the futuristic aircraft carrier article was still up on China.org.cn, Battleship Galactica and all.